I had the distinct pleasure of speaking with one of the greatest singer-songwriters of all time: Jonathan Cain. In addition to having written or co-written more than 100 songs for Journey, he has penned numerous hits for The Babys and Bad English, while also maintaining a prolific career as a solo artist. In other words, the quantity, and most importantly, the quality of Jonathan Cain’s musical output is astounding. This summer Journey is on the road with the Steve Miller Band and the Tower of Power, performing for sold-out crowds across North America. I saw them live in Holmdel, NJ and I plan on seeing them again this year. Check out the tour dates on the band’s official website to see when they’re in your area. The current lineup puts on a phenomenal show that shouldn’t be missed. Below is part one of my interview with Jonathan Cain. Part two can be read here. You were in two bands with John Waite – The Babys and Bad English. How did those two experiences differ and what are your thoughts on working with John? One was already a concept in a sense that John, Wally, Tony, and Michael had already started it in England – they had a manager and they were doing this sort of glam, pop/rock thing, and they had some success with Chrysalis and Ron Nevison. They had been leveraged by the record company. And as talented as they were, they weren’t really allowed to be the Bad Company kind of band they wanted to be. There was inner turmoil with Michael Corby who wanted to be more of a glam rock thing. And Chrysalis, of course, wanted hits. There was pressure from the record company. The money was flowing. They had this grand idea that they were going to be this big thing like the Bay City Rollers and it didn’t happen that way. They had the hits but they got into debt. The manager ran the band into the ground. When I joined, believe it or not, they were almost $750,000 in debt in 1977, so that’s pretty mind boggling. So sad, ya know, they were pretty much told what they could do. And John performed well under all the pressure, and everybody did admirable stuff during that time period, but it was still very difficult. When I came in they wanted to go a little more street, a little more rock, a little less pop, so that’s where Keith Olsen came in. Back in those days, bands actually listened to producers and we were lucky enough to have Keith, and I got to make an album – the Union Jacks record – with Keith Olsen, which was a pretty spectacular experience. He was red hot after having recently done some work with Rick Springfield, Pat Benatar – he had a lot of success. He turned the corner for us, and I think we became more of the band John, Tony and Wally wanted it to be as opposed to what Nevison wanted it to be. I learned a lot from John when it came to songwriting and the swagger of rock and roll and the business – he taught me a lot of it. It was the perfect opening for…if your’e going to do…schooling (laughs), the school of rock and roll with The Babys was just what I needed. When we opened up for Journey, I had learned a lot after working with The Babys for three-and-a-half years and I was the perfect fit for Journey. I was given creative freedom in The Babys. They could’ve made me a side guy, and that’s not what they wanted. Part of the reason I got in the band was because of the song I wrote at the audition. Songwriting was an important part and John wanted someone to lend a hand in that department, so I did and we did really well together. “Midnight Rendezvous” was a hit, “Turn and Walk Away” did good, and we were a rock band, which is what they wanted to be. We had the On the Edge album and after that everyone was shot. It was kind of the end of The Babys. All of the radio stations played nothing but Lennon music and our singles didn’t matter anymore. So, we did turn and walk away (laughs), like that single. That’s when I got the call from Journey saying, “Hey, we want you.” And John had already been playing on getting out of Chrysalis and going solo, so when I called him he said, “Go ahead and take it. It’s a good thing.” So I did. When Bad English came along, there were similar dynamics…except it was more “let’s finish unfinished business.” John and I felt like we could pick up where we left off with Neal. Then, of course, we got Ricky. We had to find a drummer and Neal got Deen in. Then voila, we had our supergroup. I thought we made a great album – that first Bad English record – it’s still a beauty when I listen to it. It’s still the best thing John and I ever did, and we had some great moments. It’s still one of the best sounding rock records I own (laughs), as far as the sonics. But the problem we had was similar – it was the management. We had ill-advised management spending too much money, which put too much financial pressure on us. You have to balance the actual spending with what you’re able to do, and in this situation I don’t think that was the case. It’s not what I wanted but it just got out of control, and we found ourselves in debt again. That was a video thing…where you’re obligated to create videos to be on the charts. Our music was on the way out. The grunge thing was coming in big time. Pearl Jam was just waiting to take over. So, we had a short fuse and I saw the writing on the wall. John and I had this feud over the publishing. He had some deal he wanted to make and take a lot of my songwriting away from me, so I just told him, “Forget it.” We ended on sour grapes, and he still has sour grapes about what we did. And he’s recently said some silly stuff about Journey on the internet. I have nothing but praise for the guy, I just wish he’d let bygones be bygones and be proud of what we did together. But he’s got his head stuck somewhere else, I don’t know. I always used to say he had a “book of bastards” and once your name was in it, that’s it (laughs). So, I’m in the book of bastards. He’ll believe what he wants to believe, but I’ve got fond memories of the work we did together. 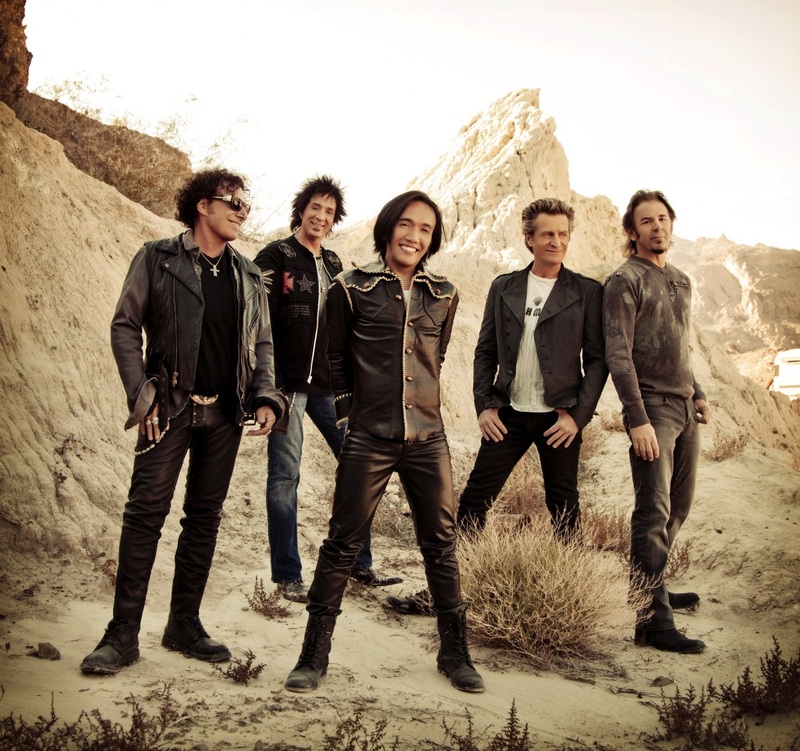 Journey’s songs feature a melodic trifecta – your prominent and sophisticated piano melodies, Neal’s blistering guitar, and of course, soaring lead vocals. Do you think that’s part of the reason why Journey’s music has had such a lasting impact? Yeah, I think it’s a combination of a lot of worlds. I’m from the neoclassical world and Neal’s from the blues/rock world…and his Santana days. It’s a balance – fire and water. I think the two of us make for an interesting…he’s sort of the edgy part and I’m the melodic part and we combine the two. Steve Perry was very good too, being in the band back in the day. He was a great sound designer, if you will. Once you heard him sing, it was pretty obvious what the music needed to be. Once I got his voice in my head (laughs)…just like John…when I got with John it was Bad English and when I got with Steve it was Journey. It was quite easy to go back to Journey in 1996 after being gone for about eight years. We got a Grammy-nominated song with “When You Love a Woman.” It sold platinum, it was just like riding a bike. It was really eye-opening coming back, being around the piano after eights – realizing that nothing changed. We still had chemistry and the passion to work together. It was fun for all of us, even if it was a brief stint. “When You Love a Woman” is easily my all-time favorite Journey song, which reminds me of your current tour. You’ve been performing a beautiful piano solo that blends together overtures from several classic Journey songs including “When You Love A Woman,” “After All These Years,” and “Patiently.” It’s a gorgeous composition and the perfect setup for “Open Arms.” What the process like when you’re creating these piano solos before each tour? (laughs) Seven for one. (laughs) I always call it the seven-for-one solo. It just came out of us struggling with what ballad to play because we don’t want to play a whole show of ballads. So I said, “Let me try this.” I kind of do that for songwriters here in Nashville. When people ask me to sit in, I do little snippets of songs rather than the whole thing. When I sing, I’m not Steve Perry. I do a quick chorus and bow out (laughs). It’s fun, and that’s where I got the idea. It seems to be cool and it’s a nod to the catalog…and the legacy of the ballads we’re known for. Even though we don’t play them all, we’re still playing “Open Arms,” “Lights” and “Faithfully.” We could probably do a night with a symphony and do all the ballads (laughs). That would be really cool. Lots of bands have done that, including KISS, Metallica and Styx, among others. Would you guys ever consider doing that? I want to, yeah, at some point. Maybe on our last one out, that would be really cool. Speaking of KISS, this year they were finally inducted into the Rock & Roll Hall of Fame, after being eligible for 14 years. To paraphrase the band’s lead singer, Paul Stanley, he feels the Rock & Roll Hall of Fame is a sham and that it’s essentially an old boy’s club that, for many years, only honored the music it found to be desirable and ignored public opinion and record sales. Knowing that immensely popular bands like Journey, Bon Jovi and Def Leppard aren’t in the Rock & Roll Hall of Fame, what are your thoughts on this sentiment? Not far off the mark in my book. I haven’t been there. I don’t plan on going there. The idea of not letting KISS perform with the current lineup is ludicrous. I think that was one of the big problems for them performing. It’s still an honor. I’m not going to say that it isn’t cool, and I don’t think it’s a sham. But I think it’s highly political and very skewed. The critics never liked us. The critics never liked Bon Jovi. They never liked Def Leppard. Our fans did. We were always panned, no matter what we did. Reviews, I don’t know, it was nuts. Back in the day, it was cool to hate Journey. And now, all the fans that love us are CEOs and successful people with lots of money and they want Journey in a big way. The tables have turned and we’re still here. We’re still standing and we’ll prove them wrong for the next few years. Our fans are enough reward for us. With the sellout crowds we’re having this summer – it’s just fantastic. You’re an excellent songwriter who has written countless hits with your bandmates. But what some people may not realize is you wrote one of Journey’s most iconic songs, “Faithfully,” by yourself. What was the songwriting process like when it came to this timeless classic? “Faithfully” came out of a concept. We needed a song that was like a postcard. One night, while watching the stage getting taken down after the show, I realized that we’re all family. We all miss home and our loved ones the same way. So I started to think, “What if there’s a song I could send home like a postcard to say, hey, I miss you, I love you and I’m here for you. What if that song could be written?” I just tripped on it and started writing down stuff on a napkin in the tour bus, and in half an hour it came out. I finished it the next day. It came out of necessity and it was cool because the idea spoke to me. “Separate Ways” was another one that we wrote on the road very quickly. And for that we said, “We could use a song like this.” A lot of those songs came about because we went, “We need a song that says this and does this.” It’s urgent, and once you get it in your head that’s it. You’re just compelled to do it. There’s a message, it comes to you and you’re there to get it. That’s the great thing about writing. It’s being open to the universe and ideas and people and emotions, and letting them roll over you. You have to be open. Watch your fans, watch what they do, watch what people are saying…to take the temperature of who your audience is and check’em out. When I go into the studio I always envision playing songs to the audience. How do you make it manageable? You just close your eyes and imagine that your’e in a concert arena. And that’s what I always do. I play for the fans. One of your best solo albums is Anthology, which includes the gorgeous tribute to your father, “My Old Man.” What was your relationship like with your Father? He was like my guiding light…pretty much my inspiration. When he passed away, I couldn’t even touch the piano. Then it dawned on me that I had been trying to do it for him all those years – make him happy. He had a vision early on that I was going to be successful. He was the one that told me not to quit when I was in LA. In fact, one time on the phone he said, “Don’t stop believin’, Jon.” I wrote that down on my doodle pad and took it with me to San Fran and wrote that with Journey. He was my mentor and my vision keeper. What a guy. I miss him. Pingback: ‘ISN’T IT TIME’ FOR THE BABYS?